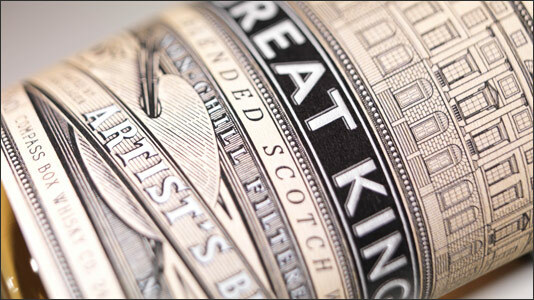 TR-06 is one of two experimental Great King Street releases from Compass Box. The idea is that one is chosen by consumers to be the second permanent release in the range. This is the smoky version, made up of 33% Lowland Grain and 67% Malt from Islay, Highlands and Speyside, of which half comes from Clynelish. Nose (90): more than average. peat, honey, citrus, spices, earth. Palate (90): powerful, oily. peat, honey, earth, citrus, spices, toffee. Finish (90): longer than average. peat, citrus, spices. So based on other whiskies I have already tasted I rate this Compass Box Great King Street - Experimental TR-06 Blended Whisky with 90 points over 100. 00-V4 is one of two experimental Great King Street releases from Compass Box. This is the lightly sherried option, with the concept being that consumers choose one to be a permanent edition. The'recipe' is made up of 28% Lowland Grain and 72% Malt from the Highlands and Speyside with a small percentage of peated Islay. Nose (89): more than average. nuts, honey, citrus, spices, cinnamon, raisins. Palate (90): powerful, oily. nuts, honey, wood, citrus, spices, cinnamon. Finish (90): average. honey, spices. So based on other whiskies I have already tasted I rate this Compass Box Great King Street - Experimental 00-V4 Blended Whisky with 90 points over 100. Did you guess it? I wasn’t able to take one over the other. Both of them were fantastic I usually love peated whiskies but this time I prefered just a little bit the sherried version over the smokey one.